In other words, searching youtube for ''police'' will return up sorts of clips - I'm interested in what the police themselves are uploading. You will see +West Midlands Police have 5 videos, +Essex Police have 4 and the British Transport Police (as +British Transport Police ) have 1 video. That's where the 10 come from. This list accompanies the posts at this blog like: UK Police on YouTube 50 Forces Compared for Aug 2014 and the search label ''police''. I will check back in one month and see what has changed. 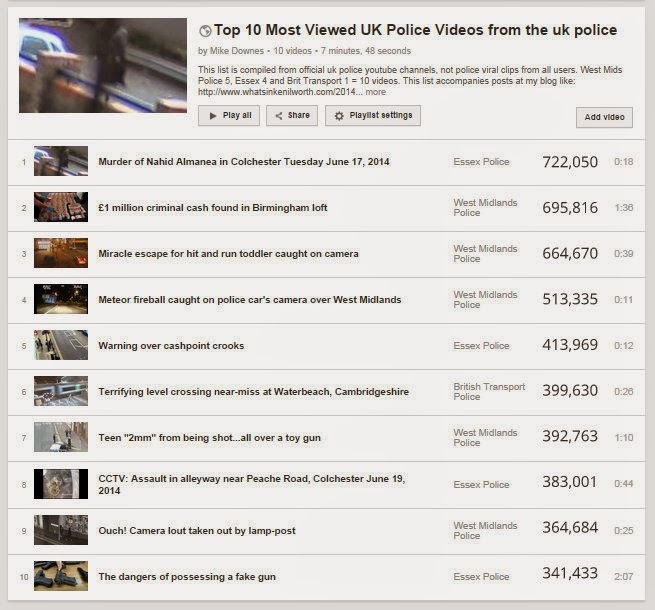 With over 12,000 videos uploaded by ~50 UK Police forces, it's only really valuable (for me anyway) to look at the qualitative data. That's to say - watch the darn videos. Too much these days is made of data scrapes and clumping to make fast charts and visualizations. Of these ten, most are Public Interest (6) then comes Appeals (2) and then Interesting (2). I will need to look at the top 100 for a better sample. In the slide above, you can see how (top left) we have Essex with a video at 722k followed by West Mids with three videos (695, 664 & 512k). In other words, 36 videos have 100,000 views or more. See the sheet in docs. A thinking point for me, is if a force like the British Transport release a near miss at a level crossing, then that's a message for everyone in the UK, if not the world. There are about 8,200 level crossings in the UK. As a contrast to that, the video of a Teen "2mm" from being shot...all over a toy gun is quite alarming (if you watch closely) when the officer sees the gun and quickly draws his own gun in defence. Without using video, it would have been impossible to show what happened - and how close the teen came to being shot. I've included the clip below.